Who Will Win the Qualifier 2 T20 Match, Between SKN vs TKR and Toss Prediction? Where Can You Watch the Live Streaming of SKN vs TKR, Eliminator or Channels to Watch? 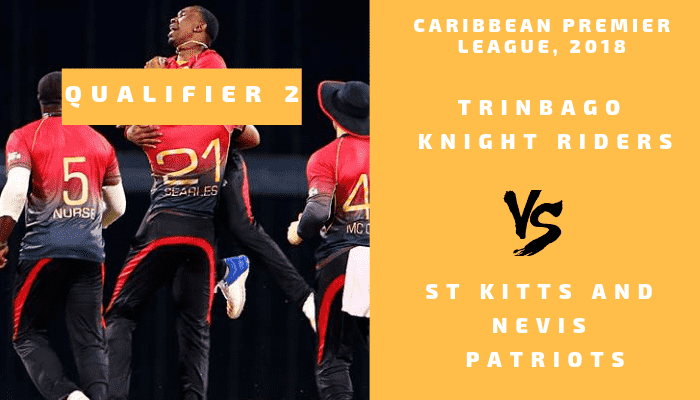 St Kitts and Nevis Patriots are all set to take on Trinbago Knight Riders on Saturday, September 15, 2018. In Today’s Dream11 Fantasy Cricket Match of SKN vs TKR Qualifier 2 T20, CPL 2018, we will cover Pitch Report of Brian Lara Stadium, Tarouba, Trinidad, Predicted Playing 11, Toss Prediction, Fantasy Cricket News and Tips and Who Will Win? You May Like to Read Asia Cup Prediction. After losing the Qualifier 1, Trinbago Knight Riders will try to bounce back in the Qualifier 2 and fix their spot for the finals. On the other hand, St Kitts and Nevis Patriots have shown their intentions and won their last three matches back to back. According to our astrology prediction, SKN will win the match today. The team winning the toss should opt to bowl first as chasing will be easy on this ground. According to our astrology prediction, SKN will win the toss and invite TKR to bat first. Date: The match will be played on the 15th of September 2018 (Saturday). Match: Caribbean Premier League, 2018, SNP vs TKR, Qualifier 2. Venue: Trinidad, Brian Lara Stadium, Tarouba. Time: 12:00 AM GMT, 05:30 PM AM IST, 08:00 PM LOCAL. The pitch of Brian Lara Stadium, Tarouba generally favours the bowlers and it is difficult to score runs on this ground. The pitch will remain the same and will favour the bowlers. Last year four matches were played on this ground and all the games were low scoring matches. The pitch will behave the same today also. The weather is predicted to be partly cloudy and mostly cloudy and it will remain the same throughout the day. There is no sign of rain. It expected to be a hot and humid day. The temperature is expected to be 27-Degree and the humidity to be 86%, which may go up to 94%. Note: The weather condition will support the Seamers in both the inning. If we look at the last five matches, St Kitts and Nevis Patriots have won two matches out of five whereas Trinbago Knight Riders have won three games out of five games. In the last encounter, TKR has defeated STKNP by 46 runs. C Munro and A Phillip were the key performers of that match. Fabian Allen, Chris Gayle, Rassie van der Dussen, and Ben Cutting are the key players of St Kitts and Nevis Patriots Team. Chris Gayle will lead the STKNP Team. St Kitts and Nevis Patriots Team have won their last three matches back to back. SNP made a couple of changes in the previous match. Sheldon Cottrell was dropped and Hayden Walsh was given a chance. Sheldon Cottrell may get a chance in today’s match in place of Hayden Walsh. Evin Lewis was unfit in the last match and his playing chance is very less today. There is no official news of his fitness but he may be dropped. Shamarh Brooks may replace Evin Lewis if he is declared unfit. Tabraiz Shamsi will lead the bowling department and Chris Gayle will lead the batting department. Chris Gayle (c), Brandon King, Evin Lewis/Shamarh Brooks, Tabraiz Shamsi, Rassie van der Dussen, Ben Cutting, Anton Devcich, Fabian Allen, Devon Thomas (wk), Hayden Walsh/Alzarri Joseph,/Sheldon Cottrell, Carlos Brathwaite. Chris Gayle (c), Shamarh Brooks, Mahmudullah, Rassie van der Dussen, Devon Thomas (wk), Alzarri Joseph, Carlos Brathwaite, Jeremiah Louis, Ben Cutting, Sheldon Cottrell, Evin Lewis, Brandon King, Ibrahim Khaleel, Tabraiz Shamsi, Anton Devcich, Hayden Walsh, Fabian Allen, Javelle Glen. Colin Munro, Darren Bravo, Fawad Ahmed, Colin Ingram and Dwayne Bravo are the key players of Trinbago Knight Riders Team. Dwayne Bravo will lead the TKR Team. Trinbago Knight Riders Team has lost their last two matches back to back. Colin Munro is the most valuable player of TKR team. TKR will play with their best team. According to crix11 prediction, TKR will play with the same team which appeared in the previous game. Colin Munro, Brendon McCullum and Colin Munro will lead the batting department and Ali Khan, Sunil Narine and Fawad Ahmed will lead the bowling department. Dwayne Bravo (c), Ali Khan, Brendon McCullum, Khary Pierre, Denesh Ramdin (wk), Colin Ingram, Darren Bravo, Colin Munro, Kevon Cooper, Fawad Ahmed, Sunil Narine. Dwayne Bravo (c), Ali Khan, Brendon McCullum, Colin Munro, Denesh Ramdin (wk), Sunil Narine, Nikita Miller, Anderson Phillip, Darren Bravo, Chris Lynn, Kevon Cooper, Shannon Gabriel, Colin Ingram, Javon Searles, Hamza Tariq, Amir Jangoo, Fawad Ahmed, Terrance Hinds, Khary Pierre. Conclusion: This is it for Today’s Dream11 Fantasy Cricket Match Prediction of SKN vs TKR, Qualifier 2, which will be played on Saturday, September 15, 2018. We have covered all the details required to win any fantasy leagues. We have covered players recent and past performance, dream11 guru and crictom prediction, all the latest news and updates of St Kitts and Nevis Patriots Team and Trinbago Knight Riders Team, weather report of Tarouba, Trinidad, dream 11 best teams, keys players, the best choice for captain and vice-captain, where to watch the live match of TKR vs SKN, Qualifier 2 and the details of live streaming of Caribbean Premier League (CPL), 2018.